For holiday-makers who wish to do more than sightseeing or lazing around a pool, Italy offers many varieties of activity for a stimulating and adventurous holiday. The country has high mountain ranges and beautiful countryside for skiers and walkers, and lovely coastline and lakes for swimmers, divers and sailors. Travellers can indulge in many activities independently, or opt for an organised activity holiday with a tour operator. On this page you'll find an overview of different kinds of activity holiday in Italy, good destinations for active travellers, listings of travel firms offering organised activity holidays, and ideas for going it alone and adding activities to your self-planned holiday. 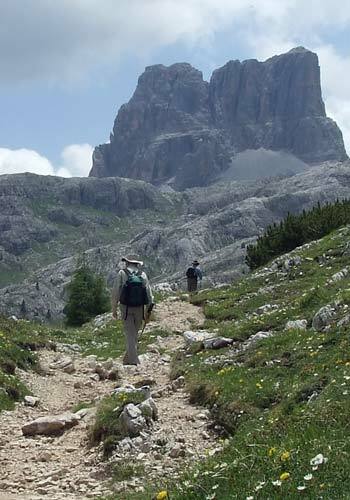 There are many types of appealing terrain for walking, hiking and trekking in Italy. For tamer pleasures, many enjoy walking along the pretty but crowded Cinque Terre coastline. The Amalfi Coast also offers sea views, including some strenuous walks at high levels. As Italy is so mountainous, you can select your own level of difficulty. The Alps and Dolomites in the north have good, marked hiking trails and you can base yourself in a ski resort; most of these are very good for walking in the summer months. The Apennines, the spine of Italy, run for hundreds of miles, with a variety of landscapes and many picturesque towns and villages. National parks in Italy include the Abruzzo, home to bears and wolves, where you can stay overnight at high-altitude rifugi (lodges). Several travel firms offer walking packages from the UK, some in groups, and some where you are self-guided. Your luggage can be taken from one hotel to the next for you, which is a big help if you're planning to move on each day. There are a number of good ski resorts in Italy, two of the most famous being Cortina d'Ampezzo and Courmayeur. As the map of Italy is so mountainous, winter provides a good choice of places to hit the pistes. The Alps bristle along Italy's northern borders, and there are ski resorts all along this northern band of the country. The Dolomites 'Superski' area consists of a huge network of places to ski, with hundreds of lifts. In Italy, cycling has never died out as a popular means of getting around town and to the shops. Many of Italy's towns have cycle lanes, traffic-free zones and sometimes public bicycle hire schemes. Several tourist boards and many hotels provide free bicycles for the use of visitors. A leisurely cycle ride is a great way to explore the long seafronts of Italy's beach resorts, although I would advise caution on busier roads. I've enjoyed leisurely holiday bike rides, on hired bicycles, along the length of Venice Lido, exploring the lagoon shore in Caorle, and visiting beaches on the Sicilian island of Favignana, any of which would be fun for the whole family. The most adventurous cyclists will be attracted to Italy's mountains, such as the Dolomites, where mountain bike trails will take you through dramatic landscapes. 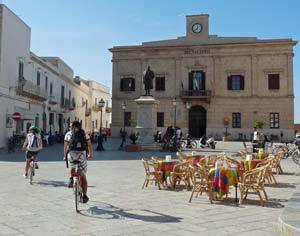 Less strenuous cycling holidays explore the Tuscan countryside, and the southern charms of Puglia. Holiday firms which organise escorted and independent cycling holidays are listed at the foot of this page. There are many golf courses around Italy, from large countryside courses to an 18-hole course on the island of Venice Lido. Italy also has an increasing number of golf resorts, combining luxury hotel accommodation with golf and other sporting facilities. > Verdura Golf & Spa Resort, with 18-hole and 9-hole courses near Sciacca in Sicily. > Donnafugata Golf Resort & Spa, near the Baroque town of Ragusa in Sicily. > Golf Hotel Is Arenas - Five-star resort in Sardinia, close to Is Arenas Golf Club. > Sheraton Golf Parco De' Medici Hotel & Resort - Hotel complex outside Rome, with a 27-hole golf course. > Borgo Egnazia - Luxury holiday complex with access to adjacent golf course, in Puglia. > Una Golf Hotel Cavaglià - Golf hotel near Biella in Piemonte. > Riviera Golf Resort - Hotel with an 18-hole course near popular Adriatic beaches. 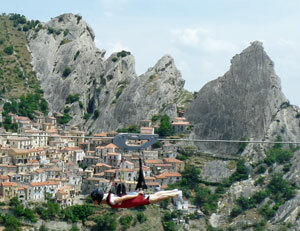 If you just want to add a spot of adventure to your independent holiday, there are plenty of great holiday destinations in Italy where you can book an activity 'add-on' - anything from a hair-raising zipwire to a day or two scuba diving. You can hire boats in many coastal resorts and islands, and it is frequently possible to rent scooters, bicycles and other vehicles to explore a locale. Note that you will often need to leave your passport and/or money as a deposit when hiring vehicles or equipment. If you are going to engage in any potentially perilous activity, make sure your travel insurance will cover it. Do your best to assess the reliability of any organisations you sign up with, and establish whether you will be able to understand and communicate effectively before embarking on leader-led activities such as diving lessons. > Lake Garda - the northern end of Lake Garda is a popular windsurfing spot. > The Dolomites - mountains offering skiing in the winter and hiking, climbing and cycling in the summer. > Egadi Islands, particularly Marettimo, renowned for scuba diving in a marine nature reserve. > Palinuro - More diving opportunities in Campania. > Cinque Terre - Classic coastal walking. > Amalfi Coast - Footpaths high above the sea with fantastic views. For a varied holiday at a countryside base, with sports facilities and opportunities for activities such as horse-riding, swimming and tennis, one of the best locations is Tuscany. In this lovely region there are many countryside hotels and farm-holidays (agriturismi), offering a combination of peace and excitement. > Headwater - Walking, cycling, cross-country skiing and snow-shoeing holidays. > Hidden Italy - Australian organisation offering walking tours. > Inghams - Lakes and mountains holidays, and winter skiing trips. > ATG Oxford - Escorted and independent cycling and walking holidays. If you are booking an organised holiday, please note that Italy Heaven takes no responsibility for the holidays or companies suggested here. You should check the small print and find out what is included, what extras you might have to pay, how much you have to pay in advance, what your insurance will cover and what registration (e.g. ATOL) the company has.